I realised this week I didn’t update you all on how I did on the 5:2 diet. I stuck to it for the six weeks and lost a total of 8pounds. Not to shabby eh? I didn’t find it that hard to be honest. I had breakfast, lunch and dinner on the ‘starve’ days and could still have some sneaky sweeties on the other days. I was gonna share before and after photos but I really want to tone up and no diet is going to do that. That’s were Jillian Michael comes in. I saw Anna’s amazing photos on twitter after completing the workout for 4weeks and thought I had to give it a try. I was even more inspired when I discovered you can view level 1 for free on You Tube. The DVD has two levels, so I will need to get it but this will tide me over for now. My plan is to complete the workout 4 times a week. I started yesterday morning and can advise this is no easy workout. It’s not just sit ups, there’s some cardio to get your heart rate up and I was seriously sweating by the end of it. Roz is doing it too so that will hopefully keep me motivated. She has very bravely shared her before photo and as you can see from the comments below bullied me into sharing mine too! Erm where is your before tummy shot partner?!? Thanks chick, might need it! In 6weeks chick! 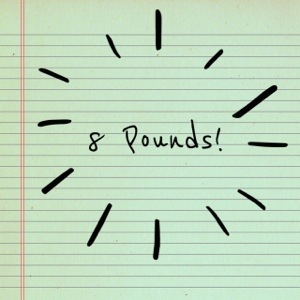 8 pounds in a week would be crazy! 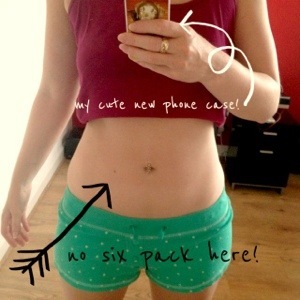 your tummy is perfectly fine! Good luck with the programme! Aww thanks honey, would just like it a bit more toned! Wow congrats! I tried to do a fast day on the 5:2 diet today and caved by 2.30PM so well done for sticking with it! I tried to do it on busy days so less time to think about food! Aww thank you 🙂 we will see hope I stay motivated! I love your blog! Good luck- and stay motivated!